Feeling stressed? Is the world too much with you? Some laughter would help. Let down your hair, if you have any, and go see the 2016 version of the Gold Fever Follies, at the old Bank of Montreal building on the corner of Columba and Washington. Opening night was delightful. 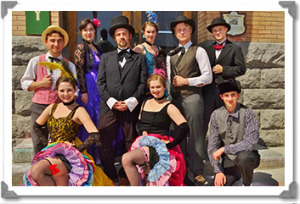 The talented and energetic Follies cast and crew put on a flamboyant, funny, action-packed, colourful and lively show. The new venue was necessitated by ongoing renovations at the Rossland Miners Union Hall, now swathed in scaffolding. The Bank of Montreal plays a part in this season's plot, so the new and much more intimate venue is appropriate. The "stage" extends down much of the length of the room, with audience on both sides. Kirsti Hack plays the voluptuous proprietor of the Velvet Hotel (in competition with Mrs. Allan); Jill Amantea is charming as "Chandler," the heroic but maligned representative of the Bank of Montreal, competing for business in Rossland with a British bank, whose representative is played by the memorable Vaughn Naylor. Vinnie Keats plays Joe the barber, enamoured of the Velvet Hotel's proprietor, who learns some key lessons about love. Ty Wright returns for his fourth season with the Follies, playing the hunky Jordan, a salesperson who rooms with another man, raising questions in some minds. Those questions are resolved by the end of the play by Jordan and "Lockhart," played by the multi-talented Casey Gray -- script-writer, stage manager, music, and casting, as well as actor. Rosslander Marco Santano appears with the Follies for the first time this year, and Kendra Bidwell and Rebecca Peterson play their supporting roles admirably. The seating is much more limited during this season, so -- once again -- people are advised to come early and avoid disappointment.